Book One in the Adventures of Blue Shaefer. Check out the July 2014 blog tour! Order from Amazon/Kindle, Barnes and Noble/Nook, Kobobooks, Apple iTunes/iPad/iPhone, from the publisher, or order signed copies directly from me! Punk, blue-haired “Blue” Shaefer is at odds with her workaholic single mother. Raised as a city girl in a suburb of Indianapolis, Blue must abandon the life she knows when her unfeeling mother moves them to a dreadful small town. Blue befriends the only student willing to talk to her: computer nerd “Chip” Farren. Chip knows the connection between the rickety pirate boat ride at the local amusement park and the missing money from an infamous bank heist the townspeople still talk about. 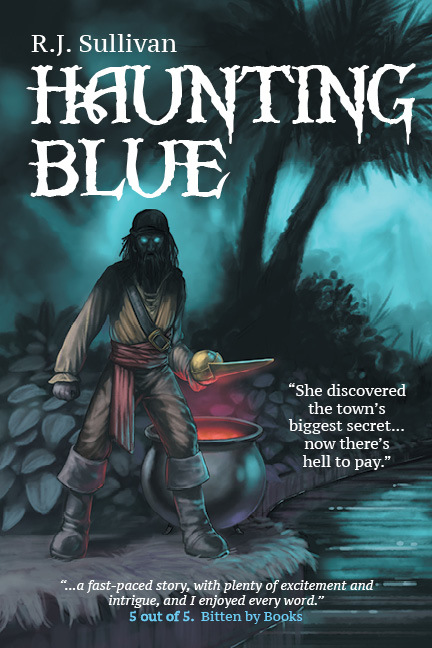 When Blue helps him recover the treasure, they awaken a vengeful ghost who’ll stop at nothing–even murder–to prevent them from exposing the truth behind his evil deeds.